While many chalet-type homes have a panoramic view towards the rear, this one has a different orientation with a panoramic windowed façade. Ideal for a sloping lot, with a lot grading up towards the rear of the house, the main level becomes the basement and the second floor becomes the main level. The basement level boasts a two-car garage, entry foyer, generous storage area, ample laundry/sewing room with drying area, a bathroom and two good-sized bedrooms. A family room enjoys abundant light by day and the glow of a fireplace by night. The upstairs activity center is open and flowing with a kitchen with central lunch counter, an independent breakfast area, a dining room which can easily sit up to ten and family room with breathtaking cathedral ceiling. The master bedroom has a command view of the panorama, his and hers closets and private bathroom for pleasure and relaxation. Bedroom four could also be used as a den and the whole level enjoys direct access to an impressive wraparound deck at the front and above the garage. 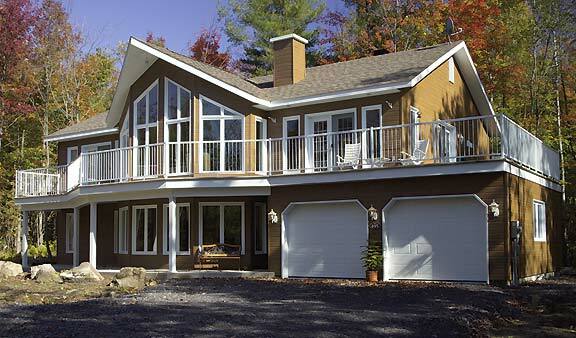 Looking for other panoramic view house plans or vacation house plans? Check our Panoramic View Design Collection, Vacation & Waterfront Home Design Collection. Want to receive all of our newest designs directly by email? Create a “New House Plans – Latest Trends” Alert and be the first to see all of our new releases!